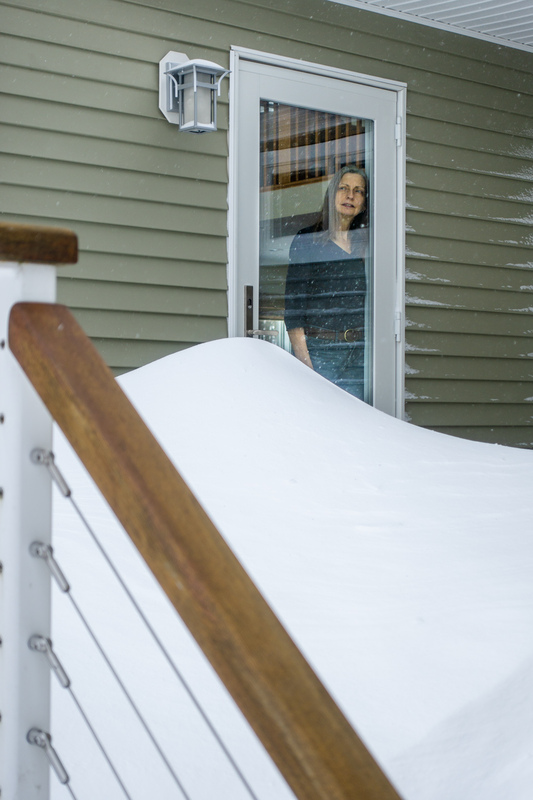 We had a little snow last night. Catch my drift? Jeepers, what’s the big hurry? Autumn 2018 colors in our neighborhood have been notably subdued, more of a stumble than a Fall. We’re on the brink of perma-brown taking over as rain and winds wash away, during the next several days, what little color we had. 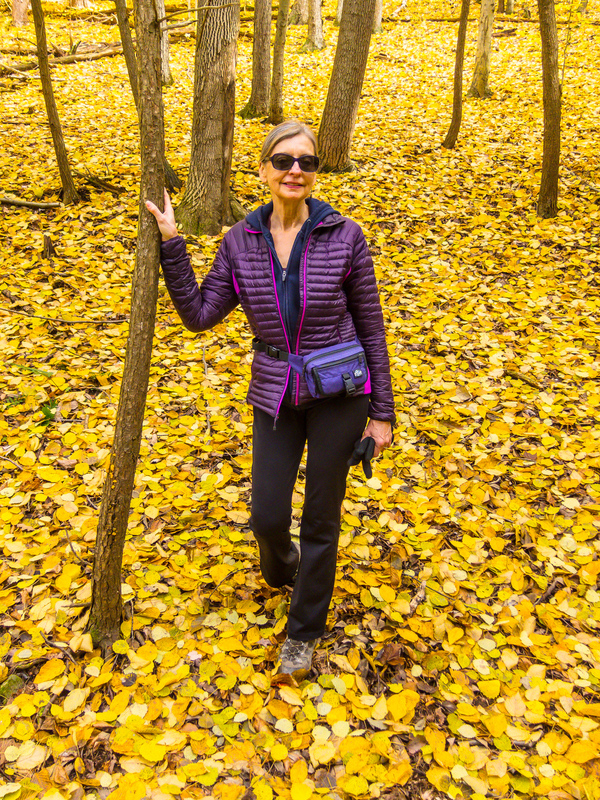 Today, however, Lori and I were able to enjoy a comfortable sunny walk in Sweedler Preserve, one of the many gems within easy reach of our place. 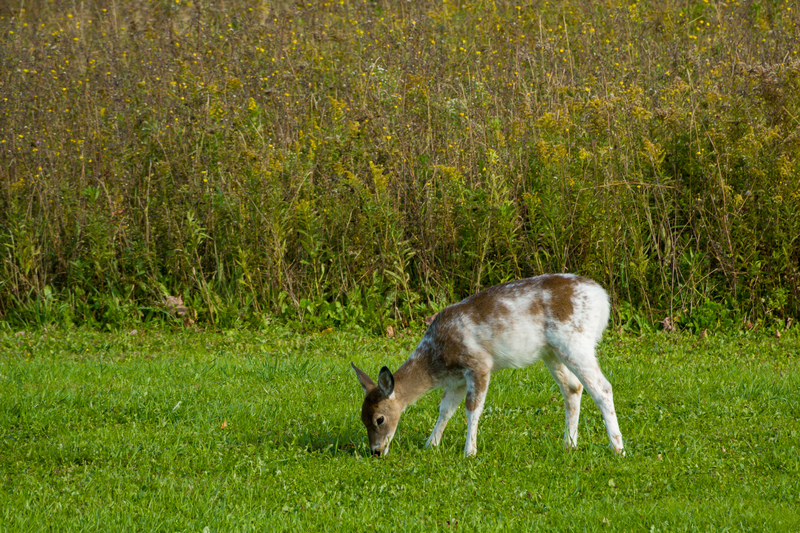 A young piebald deer is a frequent visitor to our rural area. 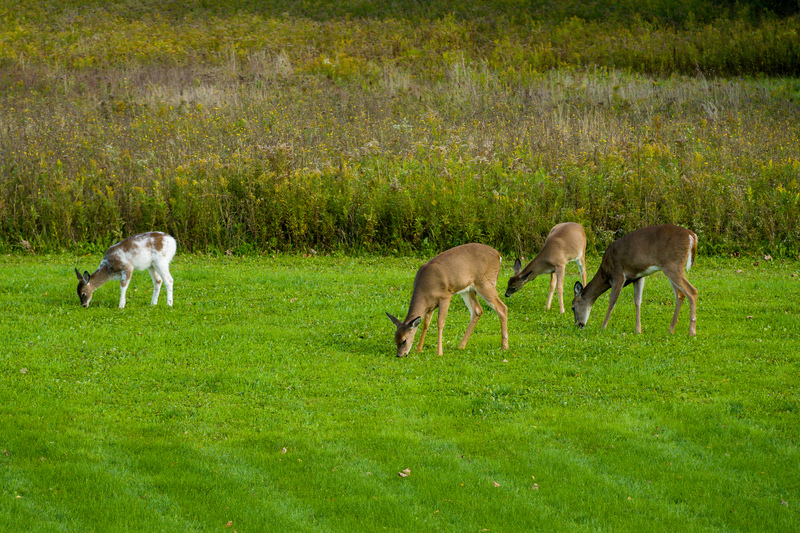 Deer, including a piebald deer on the left, graze in our backyard. A young piebald deer is a frequent diner in our local rural area. 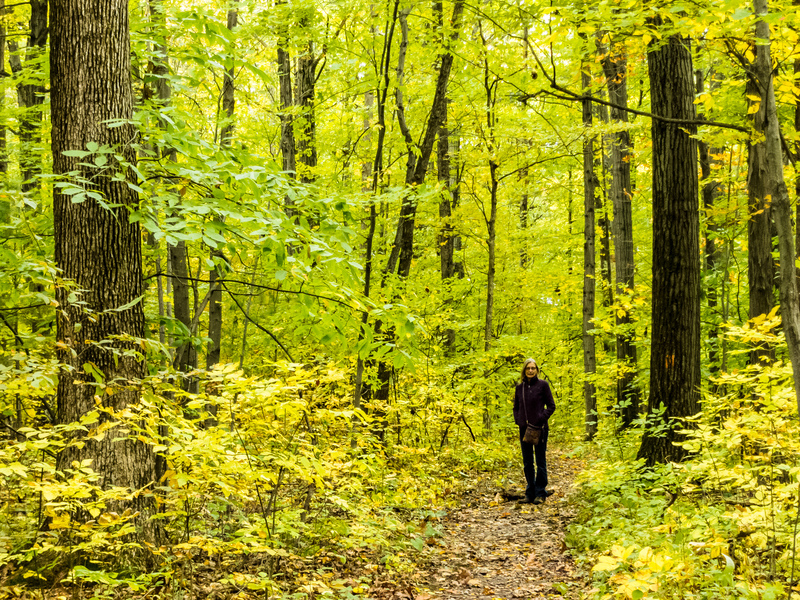 We checked out Birdseye Hollow State Forest and found the main northeast-to-southwest trail was too swampy to enjoy. The Finger Lakes Trail part going through the State Forest looked like it may have parts at higher elevations that could have drained a bit better. Sanford Lake looked promising for a short relaxing paddle and an easy launch at a nice boat launch on the south end. We ended up walking about 4+ miles along a trail section from Sanford Lake and up a dirt road through some nice woods. 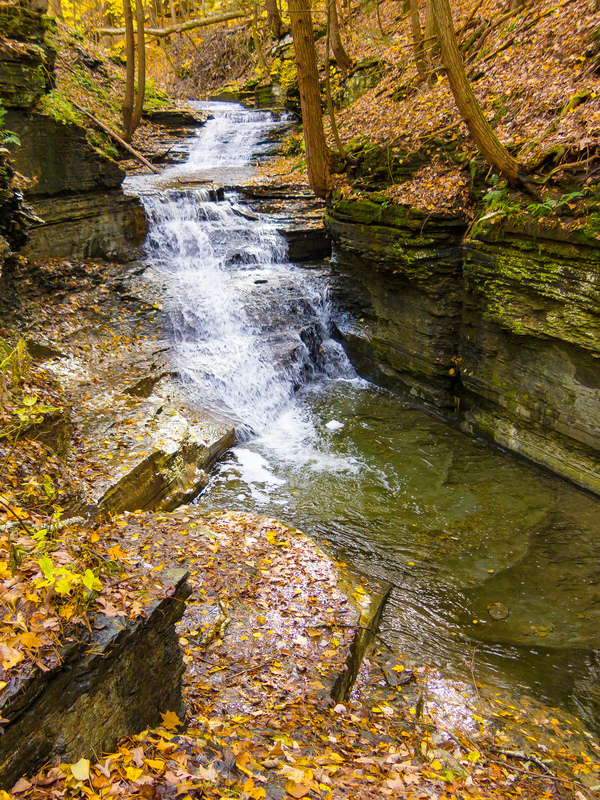 Finger Lakes National Forest looks much more promising for hiking. 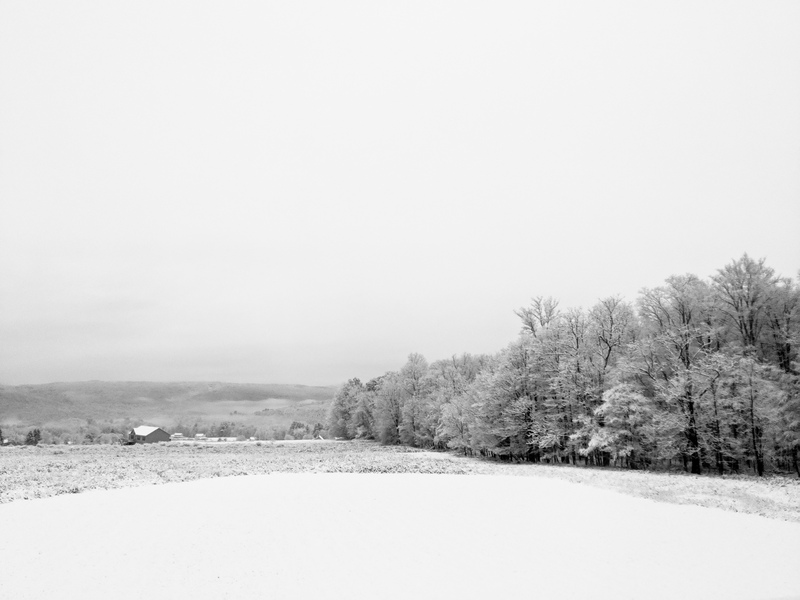 It’s along the ridge separating Cayuga and Seneca Lakes. 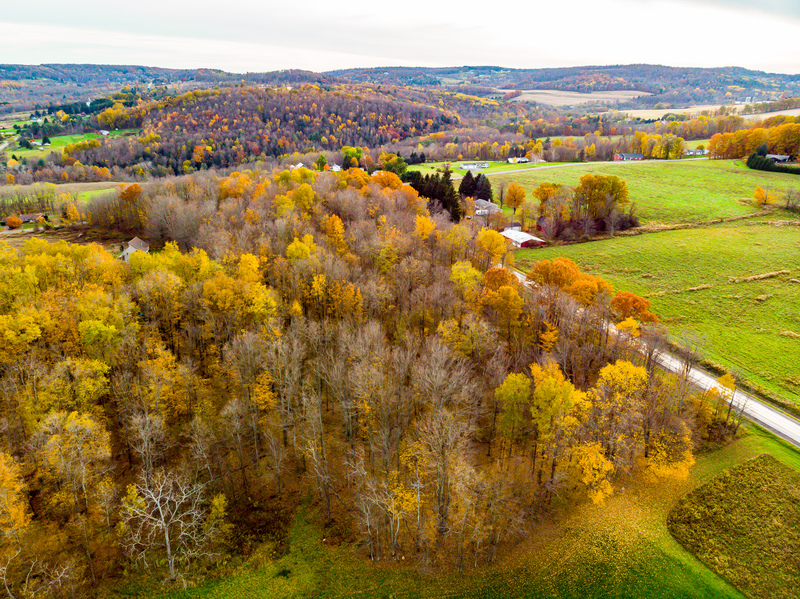 It’s an interesting mix of hardwood forest and open pasture lands in active use by local farmers. We sampled a few miles of the No-Tan-Takto and Interloken trails and thoroughly enjoyed them–we will be back for some more serious exploration of the extensive possibilities. 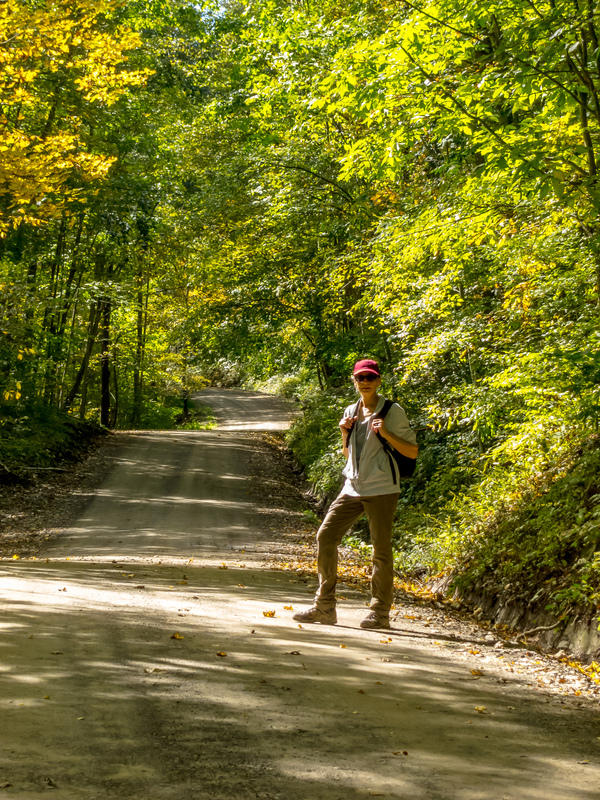 Lori waits for straggling hike-buddy on dirt road in Birdseye Hollow State Forest. 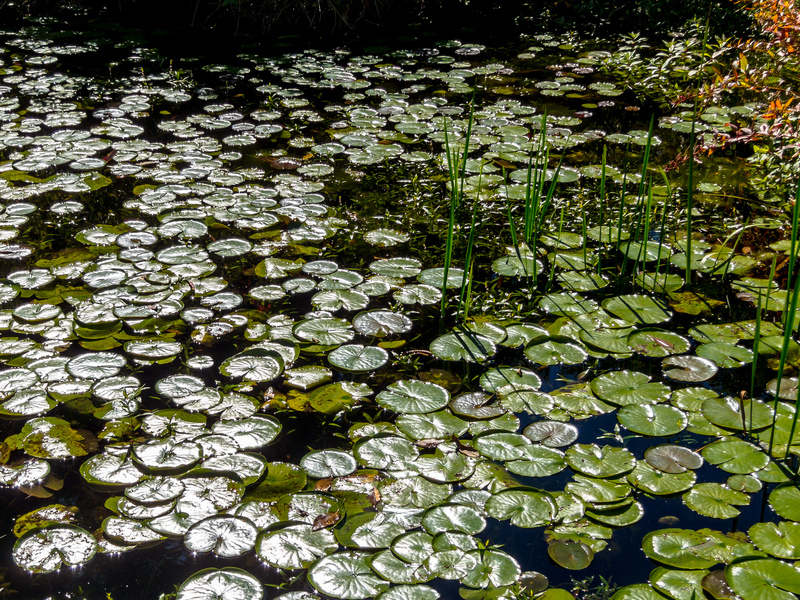 Lily pads on Sanford Lake in Birdseye Hollow State Forest. 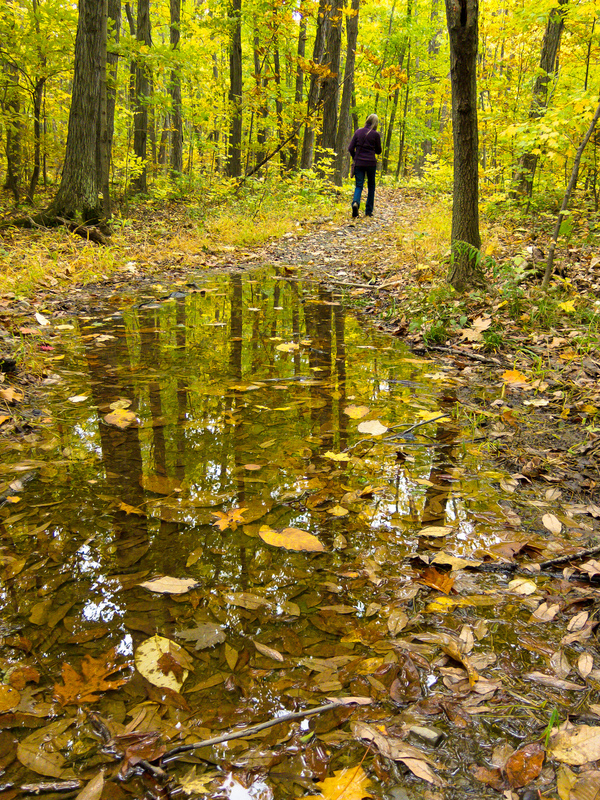 An unusually wet summer and fall left many trails wet and muddy. Lori is on the Interloken Trail in Finger Lakes National Forest. 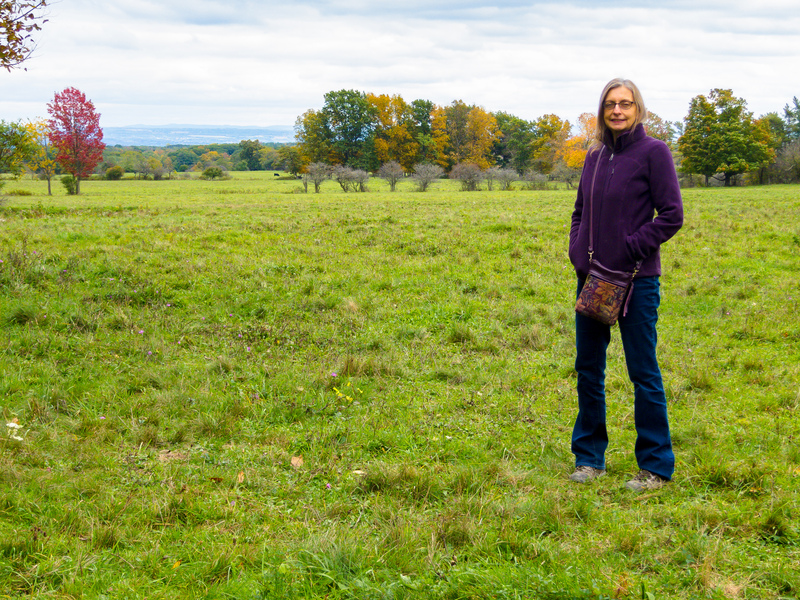 Lori in an open pasture at the north end of the Finger Lakes National Forest. 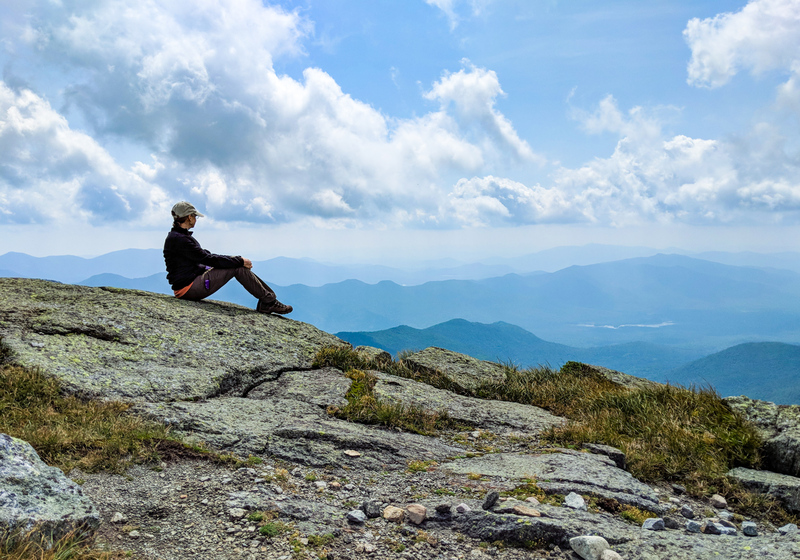 Lori takes in the views from the top of Mount Marcy, highest peak in New York State, after a long hike and before an even longer trek back. 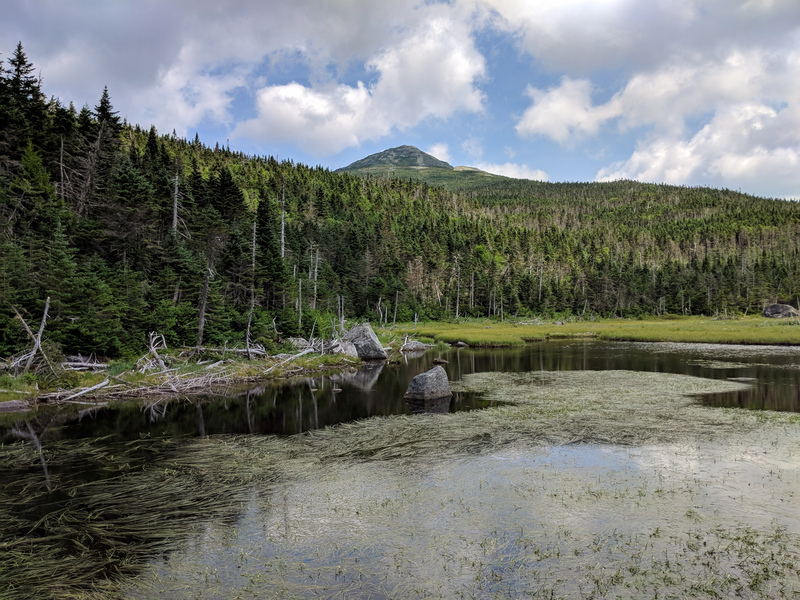 Lori and I visited the Adirondacks for a few days, primarily to give Lori an opportunity to hike Mount Marcy, highest mountain in New York State. We did our 16-mile loop on a miserably hot and humid day. Our descent included a stop at lovely Lake Tear of the Clouds with Mount Marcy looming over it. Our 60+ year old bodies complained a bit on the long trudge back but we done good. Lori is a real trouper–what a woman! There were other highlights during our visit up north. We had a really wonderful dinner at The Deer’s Head Inn in Elizabethtown. Our meals were superb, wonderfully prepared, and we were well taken care of by a hard-working and friendly wait staff. We brought our canoes intending to paddle the Essex Chain Lakes near Newcomb but unfortunately a bridge repair project thwarted our plans. We headed back to Newcomb and stopped at Cloud-Splitter Outfitters to ask for suggested alternatives. Ruth was very generous with her time and knowledge as she pointed out several options in the area. We intend to head back in the future to check them out. We spent the good part of the day canoeing on Henderson Lake near the Upper Works at Tahawus, one of Ruth’s recommendations. Loons were our only companions on the lake during most of our exploring (with a kayaking couple appearing as we returned to the launch site). The 3/10 mile portage required to get to the lake is enough to prevent 9/10 of the people who might otherwise considerate it. It’s a beautiful lake with spectacular high peaks views. We managed the portage easily with our Hornbeck light-weight canoes but started mulling options for making it even easier for future longer portages. On our way home we stopped at Hornbeck Boats in Olmstedville to get our canoes outfitted with yokes for easier portaging. While waiting for the guys in the shop to do the job, we had a fun visit with Pete Hornbeck and his son-in-law Josh. Pete also gave us a poster personalized with his drawing (something he does for most clients), our first addition to our Hornbeck Collection. We couldn’t be happier with our canoes and the pleasure of doing business with these guys. After getting our canoe yokes, we did the 15-minute drive to North Creek to grab a quick lunch at Cafe Sarah which we’ve come to consider a standard stop on our way through the area. Always good! So, in short, no fatalities, no lasting injuries: another successful adventure in the Adirondacks. 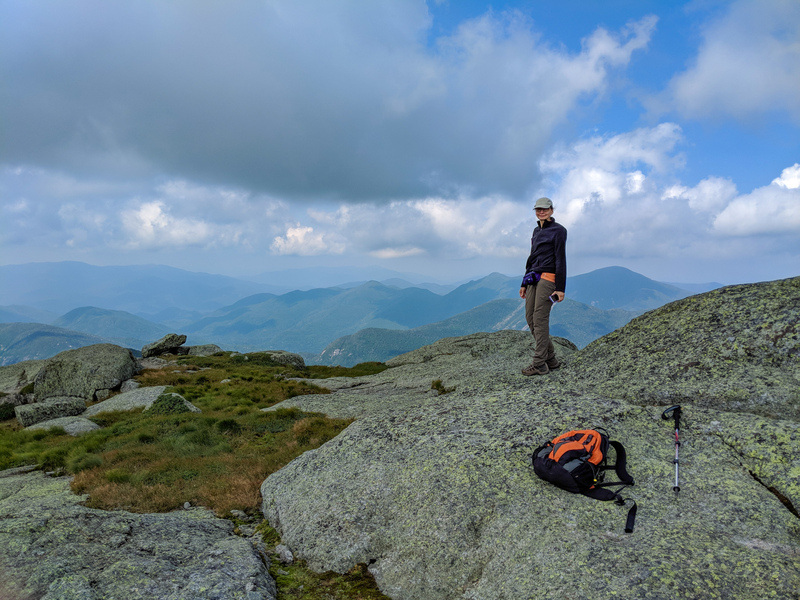 Lori takes in the views from the top of Mount Marcy, highest peak in New York State, after a long hike and before an even longer hike to return. 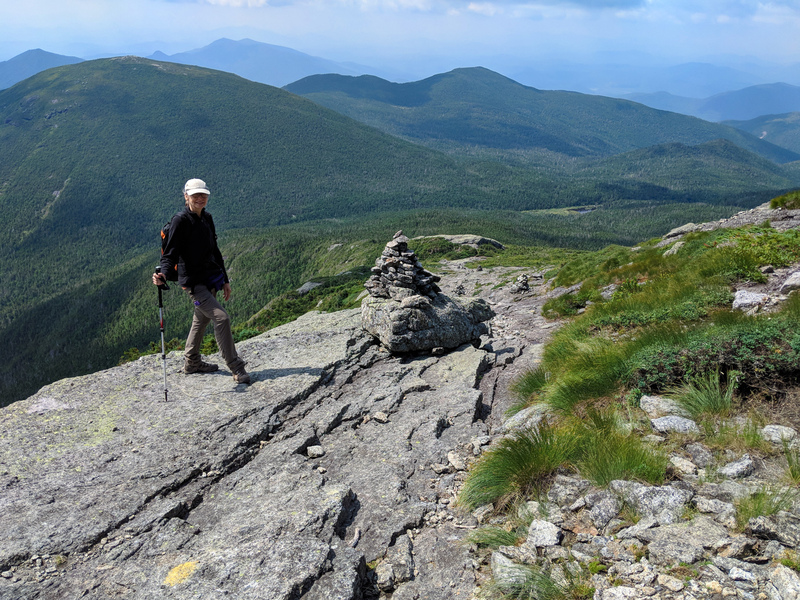 Lori follows the cairns marking the descent on the West face of Mount Marcy. 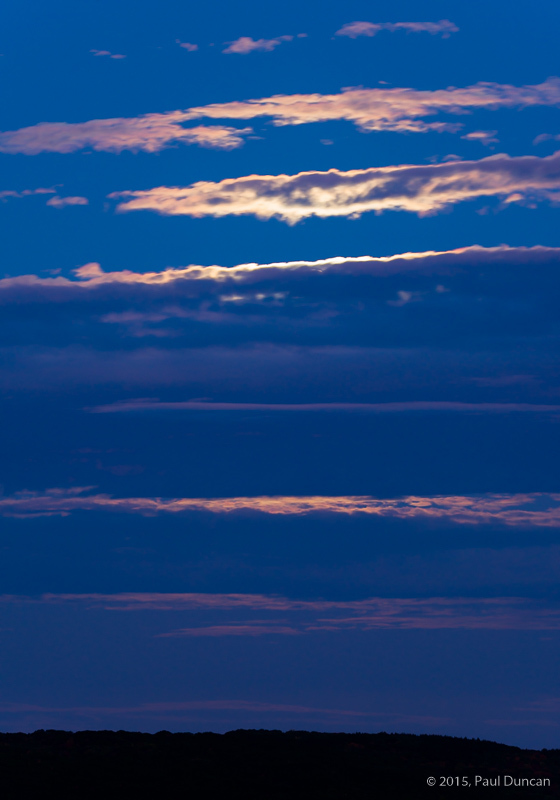 The Skylight peak is to the left, Lake Tear of the Clouds to the right in the distance. Often cited as the source of the Hudson River, Lake Tear of the Clouds is the highest pond in New York State. Mount Marcy is in the distance. 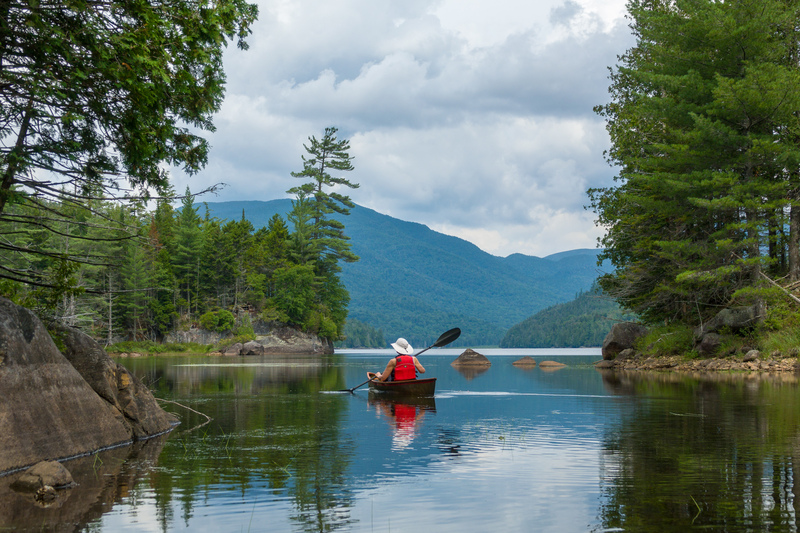 Lori paddles her Hornbeck canoe heading out to the main part of Henderson Lake. 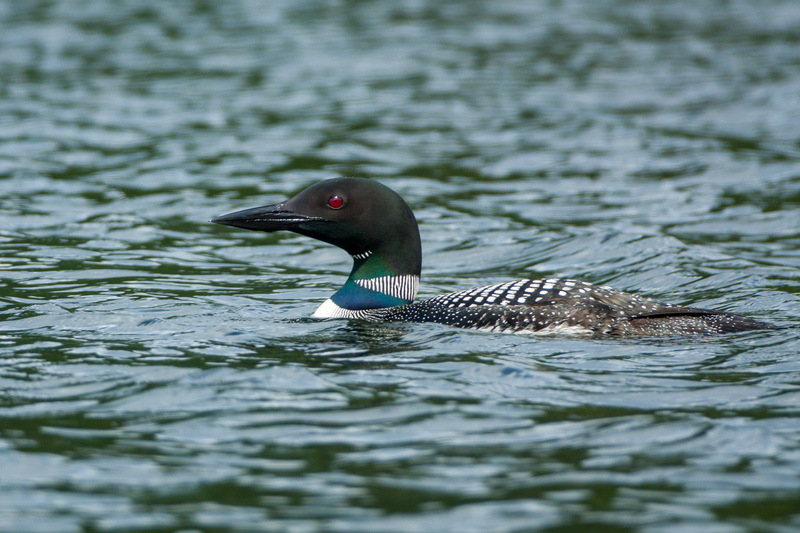 Loons (many) were our only companions for most of our time on Henderson Lake. From the north end of Henderson Lake, we had dramatic views of Wallface, Indian Pass, McNaughton Mountain, and many others. Lori paddles from the southern end of Henderson Lake back to the main part of the lake. Yikes! A vacation video: with a post title like that, I wouldn’t blame you if you ran in the opposite direction. If you suffer through it however, you’ll see my first attempt at video production using footage from the Sony DSC-RX10 iii camera. I’m impressed. Some clips are shot at ISO 1600 and you can’t really tell easily from the results. I obviously have to work on technique and get a bit better at editing but not too bad. 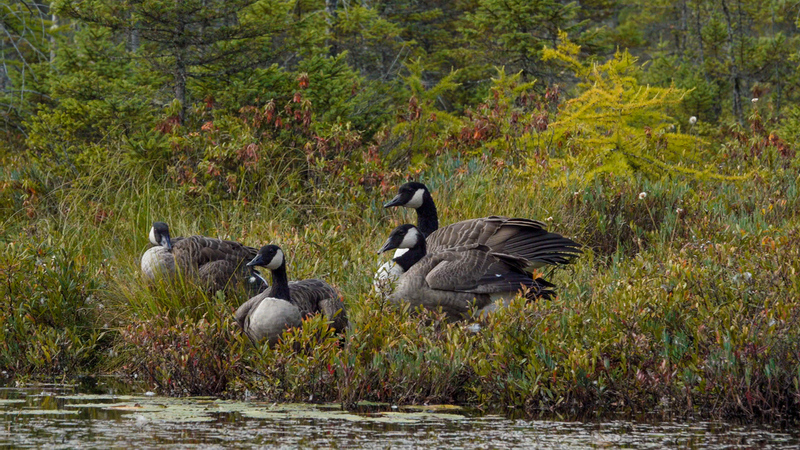 All were shot in the Adirondacks of upstate New York State. All are cropped frame grabs from video clips. 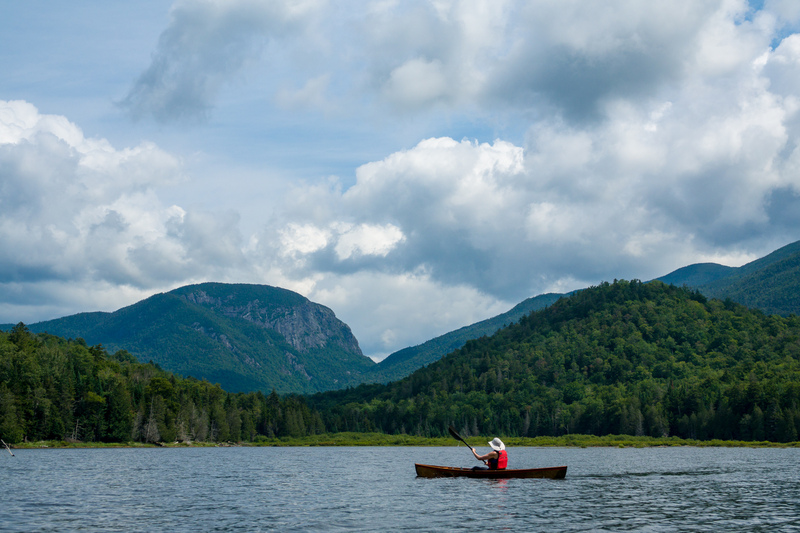 While on vacation we paddled a total of about 20 miles on 9 ponds and 2 rivers and thoroughly enjoyed our canoes. 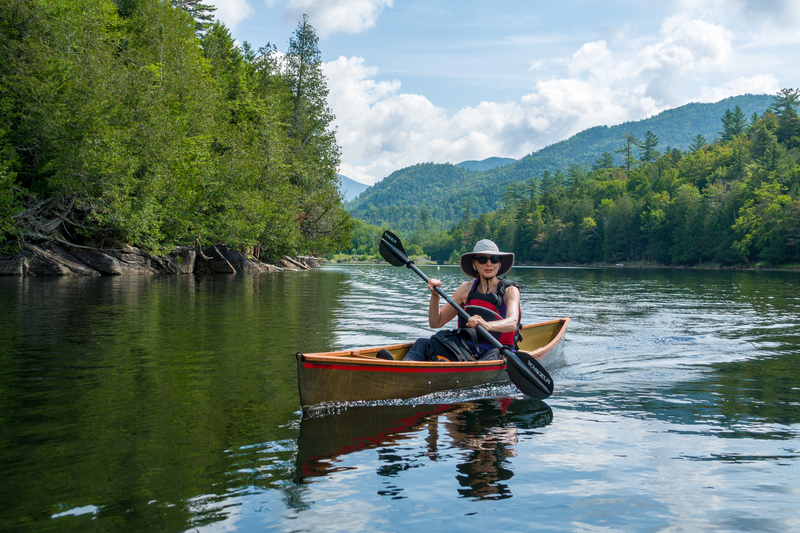 They’re easy to manage, very maneuverable, a pleasure to portage, and just right for the mix of ponds, lakes, and waterways in the Adirondack mountain area. We don’t miss our big heavy touring kayaks (although they handled camping and nasty weather beautifully). I was a bit surprised how nicely the video frame grabs came out. 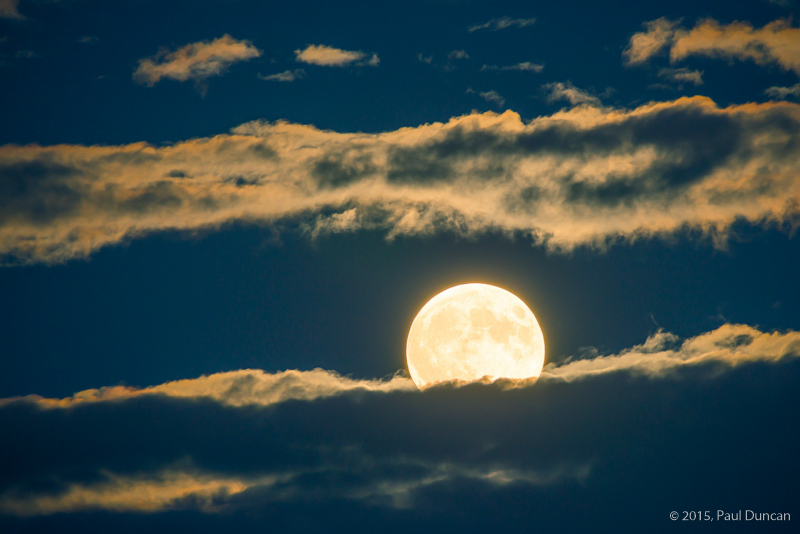 You wouldn’t print large from the size but it has plenty of resolution for Web use. 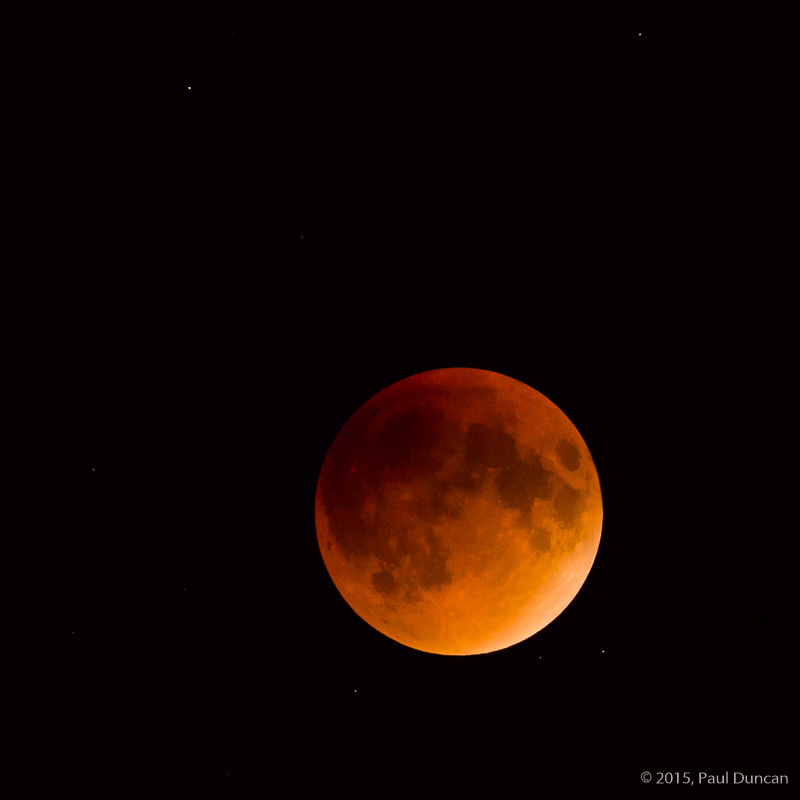 Video clips were shot from a Sony RX 10 III working out of a Pelican case sitting in my canoe. It worked out rather well although there are tweaks I’ll be trying in later efforts. 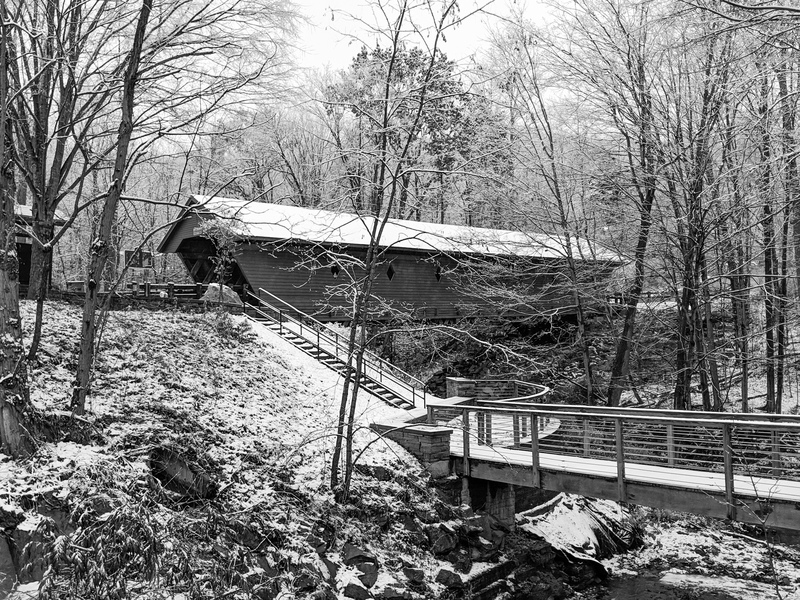 Outdoor photography on a cold winter day can be challenging trying to balance keeping hands warm but allowing the dexterity to work the seemingly-ever-shrinking controls on cameras and lenses. I picked up a couple rechargeable hand warmers to try and they’re working out great. I keep a warmer in a coat pocket along with a spare camera battery. Wearing light polypropylene glove liners, I can work the camera with little trouble and then just slip my hand in the coat pocket and grasp the warmer to get the fingers toasty in no time. Keeping the spare battery warm in the pocket keeps the camera battery viable when it needs to be switched into duty. The MJ Gear warmers I picked up are rechargeable via USB. They have some extra features that are handy as well. 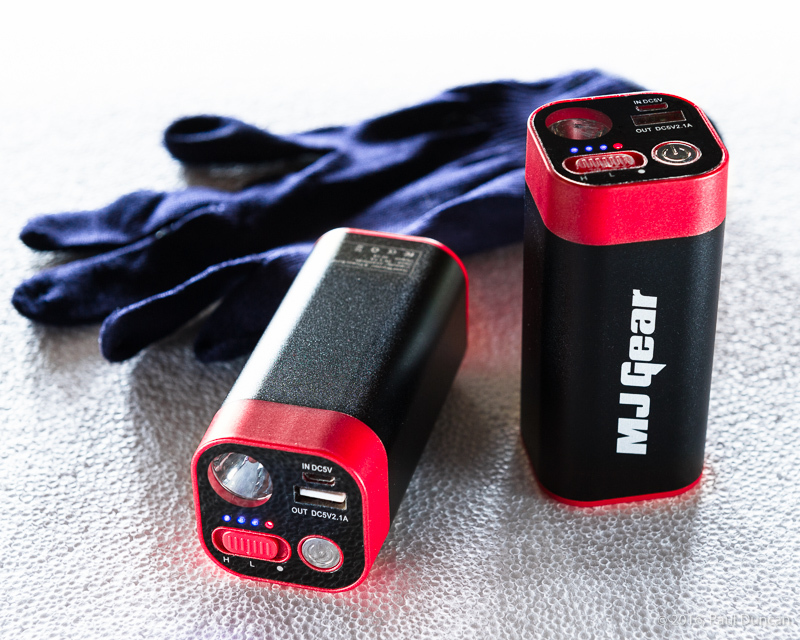 You can use one as a source of power to recharge your cell phone or other USB-rechargeable device, it has two power settings for the warmer (I’ve found the low setting is all that’s needed most of the time), and it has a powerful little LED light that could come in handy. This combination of features makes these hand warmers more appealing than the chemical pack or lighter-fluid powered alternatives. 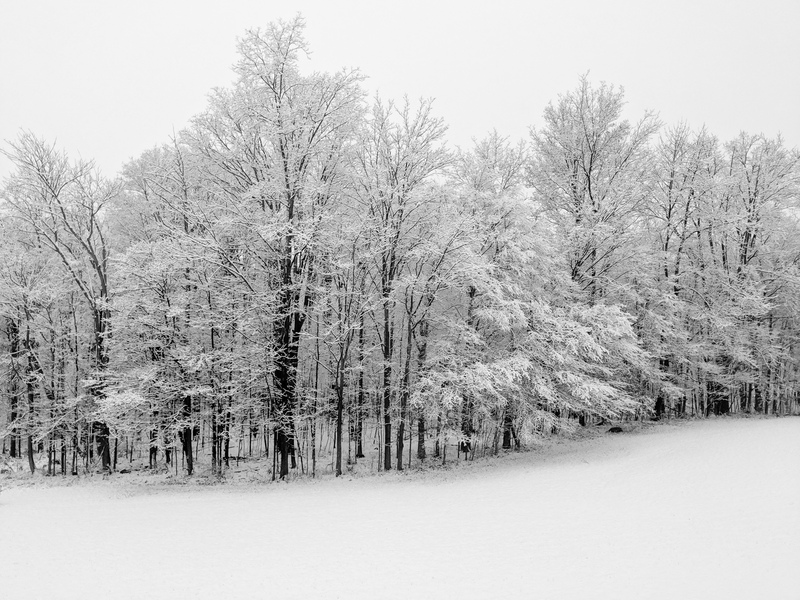 Frostbite and photography don’t work well together–hand warmers keep things comfortable on those cold outings.